Developed to defend skin from the increasing impact of environmental pollution (which can lead to sallow, uneven tone, loss of firmness and hyperpigmentation), think of this as a topical ‘multivitamin in a jar’. Renowned for its pioneering glycolic acid formulations, Alpha-H’s ground-breaking new non-AHA treatment contains a potent cocktail of vitamins A, B, C and E blended with ‘Pollushield’, an innovative polymer that acts like a microscopic ‘net’ over skin to prevent the absorption of toxic metals and urban grime. Swiftly absorbing into skin, this clever cream optimises cellular function, inhibits oxidative stress and massively boosts epidermal hydration – phewf! The effect of pollution is taking its toll on our skin – in the form of pigmentation, inflammation, damaged barrier function, loss of firmness and other signs of premature ageing. 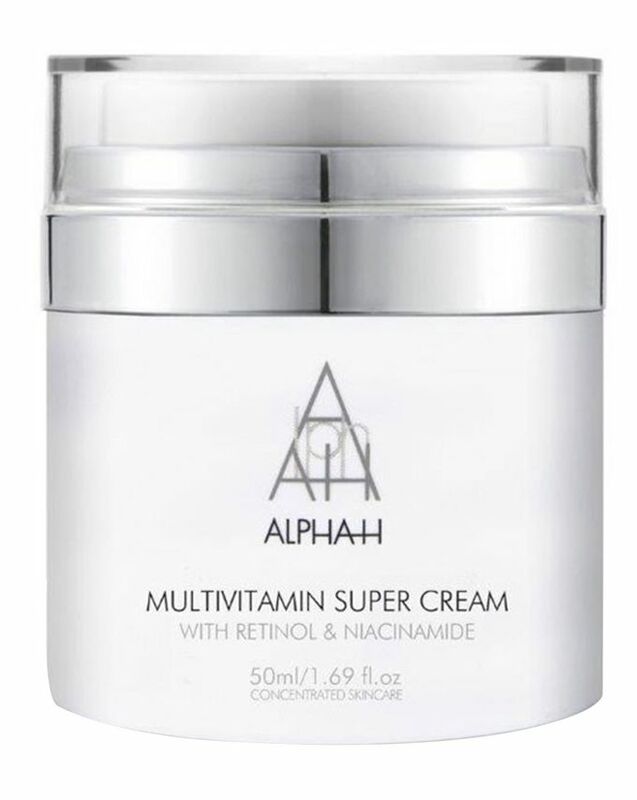 Guarding your complexion against environmental damage while supplying a brilliant boost of hydration (both immediate and long-lasting) Alpha-H calls this innovative Multi Vitamin Super Cream a topical ‘multivitamin in a jar’. 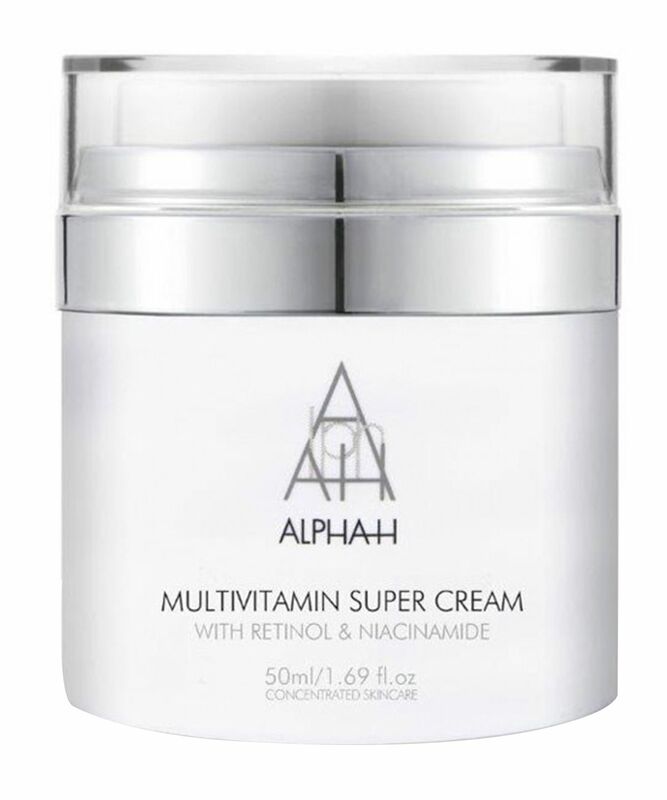 Delivering time-released doses of bioavailable vitamins, this concentrated cream contains vitamin A (retinol) to help reduce wrinkle depth and firm the skin; vitamin B (niacinamide) to increase production of ceramides and fatty acids to build moisture; vitamin C (ethyl ascorbic acid) to brighten skin tone and provide antioxidant protection and, finally, vitamin E (tocopherol acetate) to promote healing, hydration and repair. Alongside this potent cocktail of skin-enhancing vitamins, the cream contains ‘Pollushield’, an innovative polymer that acts like a microscopic net over the skin to prevent the absorption of toxic metals and urban crime. This ground-breaking shield is clinically proven to trap between 74 and 97% of pollutants over a six-hour period, while also protecting and maintaining the activity of the skin’s langerhan cells, which are a crucial element of the skin’s immune system, guarding against bacteria, viruses and the daily attack of pollution. Dispense 2-3 pumps and massage over the face, neck and décolletage, using gentle upward motions. Can be layered over your chosen Alpha-H Vitamin Serum day or night for optimum results. I used it for a long time and it was never good. The skin is irritated, the pores are enlarged, there is no improvement. I have tried some of Alpha H products and liked them and thought maybe this will work great for me. But every time I would use it gives me some random zit/acne and it will take ages to get rid of and will leave a scar. Save your money.